The OpenStreetMap London hack weekend also saw Jo Walsh working on the first stage of a building details editor for Android. I worked on a mobile app which I was pleased to get into a basically working state. It is called osmbi3, which stands for OpenStreetMap Building Information and/or Zombies. The aim was to geolocate the user and find nearby buildings using an Overpass query. This could then be linked to building management information or form the basis for some location-based game. Read the rest of Jo’s article here. Want to catch up in person? How about a return visit, and whilst you’re there you can always attend State of the Map Scotland! We recently blogged about the OpenStreetMap hack weekend in London. In that post we wrote about how Jochen Topf & Harry Wood worked on integrating TagInfo into the OpenStreetMap Wiki. They built a solution to auto-populate the wiki with data from TagInfo based on a Taglists template. You can continue to read this over on Jochen’s blog. It was great chatting to Jochen and Harry about the potential of this to help keep our wiki up to date and accurate. If you have any comments or suggested improvements feel free to post them below and we will ensure they get passed on. Last weekend I attended the OSM London hack weekend. The theme of the event was mobile, a key area where OpenStreetMap can grow it’s current offering. Timing couldn’t have been any better – just 2 days earlier the press was reporting that smartphone use surpassed the use of laptops in the UK. Our hosts for the weekend were Geovation Hub which is part of the Ordnance Survey but feels very different. It felt much more like a swanky up-start focussed on innovation and not tied down with years of history and layers of bureaucracy. Geovation describe themselves as a “co-working space for individuals, businesses and aspiring entrepreneurs to collaborate, exchange ideas and innovate around ventures that are underpinned by geospatial data“. First day of the OpenStreetMap hack weekend at Geovation Hub, London. The weekend was well attended with 25 developers working to make OpenStreetMap better on mobile. Many of the names will be recognisable to avid OpenStreetMappers and it was great to catch up with those who I hadn’t seen since State of the Map 2013 in Birmingham. Jochen Topf & Harry Wood worked on integrating TagInfo into the OpenStreetMap Wiki. by building a solution to auto-populate the wiki with data from TagInfo based on a Taglists template. Harry then continued to work on TweetFellows – an Open Source tool that will enable multiple people to send tweets from the @OpenStreetMap twitter account. TagInfo also saw some improvements to the way it is displayed on mobile devices thanks to Christopher Baines, whilst Marc T made the nominatim web page better on small screens (not live yet). Sarah Hoffmann was also working on nominatim and implemented lots of bug fixes before starting work on a new feature that provides additional information such as opening hours and accessibility with each nominatim search. Jo Walsh (aka zool) built the first stage of a building details editor for Android. It currently downloads the data around you based on your GPS location, with editing functionality the next stage of development. 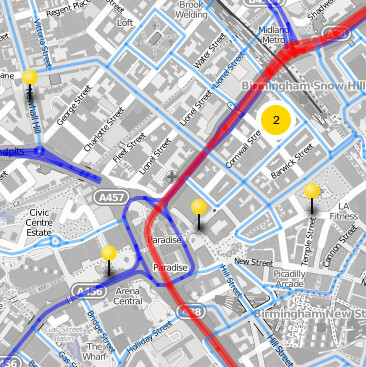 The OpenStreetMap editor Vespucci also saw some development as Mick Orridge added the ability to view GPS traces as a new layer. Nick Whitelegg added support for GeoJSON to MapsForge. This will help to ensure that the data can be easily kept up to date and could replace the current MAP files that tend to only get updated once a year. Serge W started work on a really novel app idea – a wifi scanner that looks for wifi networks associated with well known stores (e.g. McDonalds) and then asks whether a node should be added to OpenStreetMap. Finally, Robert Scott was working on porting OS Musical Chairs to the new OS OpenNames data – perfect given our location. For more see also the GeoVation blog post. I’m already looking forward to seeing what the next event can do! Earlier this year at State of the Map US, Dale Kunce from the American Red Cross presented OpenMapKit. Traditional field data collection tools for OpenStreetMap have either relied on paper or are too complicated, or lack an understanding of traditional survey techniques. OpenMapKit is designed to collect detailed survey data on mobile devices. It’s structured questions helps you to create rich data (if it’s a restaurant then what type of food, what are the opening hours, is it disabled accessible?) on the move. Although Dale’s presentation (embedded below) is still way too complicated for me to fully understand, I am looking forward to testing OpenMapKit when it becomes available on the android Play store. If you are interested in mobile tools for OpenStreetMap, either as a developer or as a mapper, then come along to the London development event, on the weekend of 8-9 August 2015. Strava routing errors: Useful or just another MapDust? It is now becoming increasingly difficult to spot errors in OpenStreetMap just by looking at the map on openstreetmap.org. To help we have a collection of quality assurance tools, and this weekend I discovered a new one developed by Strava. The keen cyclists or runners amongst us will recognise the name – Strava is a phone app/service then enables you to monitor your athletic progress over time and compare it against others. To do this it keeps a track of your run/cycle using the GPS built in to your smartphone. Consequently Strava have built up a large database of GPS traces and user contributed map errors. From this they have built a “routing errors” website to help iron out any issues in the underlying map data, which naturally is based on OpenStreetMap. Strava’s ‘routing errors’ service (link). The service highlights 2 different types of errors: those manually entered by it’s users, and those automatically detected from the map data and the recorded GPS traces (e.g. many cyclists riding the “wrong” way down what is a one-way street in OpenStreetMap suggests that the OSM data may be incorrect). I’ve had a quick play with this new quality assurance tool (with mixed results), but I’d love to hear your views. 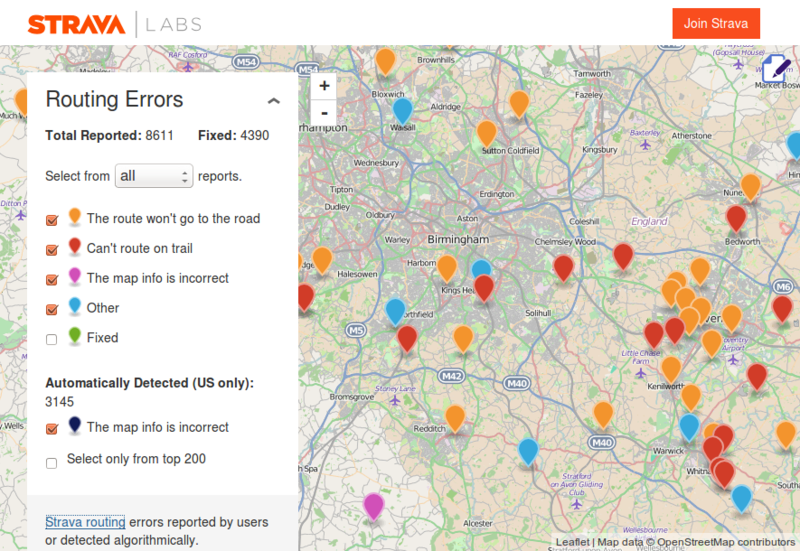 One concern is that the manually submitted “errors” may be a problem with user behaviour or the Strava app itself, rather than an issue with the OpenStreetMap data, al la MapDust – a similar, and now quite dated service from Skobbler. But is this view too pessimistic? Is there useful data in the manually submitted errors? And how about the (US only) automatically detected errors? Are these a reliable source of quality assurance data for OpenStreetMap? Let us know your views in the comments section below and feel free to share any other great QA tips you may have.